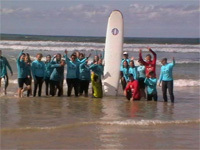 The Disabled Surfers Association operates from locations in Ocean Grove and the newly formed branch in the South West Victorian coast town of Warrnambool. Their locations feature Accessible Change Facilities, ramped access from car park facilities to beach, Aussie Beach Wheelchairs and Surf Life Saving Facilities throughout Summer. Leisurelink is recognised as one of Australia’s premier leisure facilities. With health, fitness and fun all under one roof and open all year round, this is the best place to exercise and play. They have a multi-use warm water pool with ramp access and family/ accessible change rooms, toilets and lockers. Located in Ocean Grove, the Bellarine Aquatic & Sports Centre has a range of services available. From Aqua Aerobics, Group Exercise classes to a fully equipped gym, there is something to get everyone in shape. The Centre can host children’s birthday parties and has creche and occasional care facilities. Change rooms, toilets, lockers have separate wet and dry areas plus family and unisex accessible rooms. Simonds Stadium is the home of the Geelong Cats, an Australian Rules Football (AFL) Club. The AFL season generally runs from February to September, with approximately 10 ‘Home’ games played in Geelong. Cricket, soccer and other sports are also held at the ground.